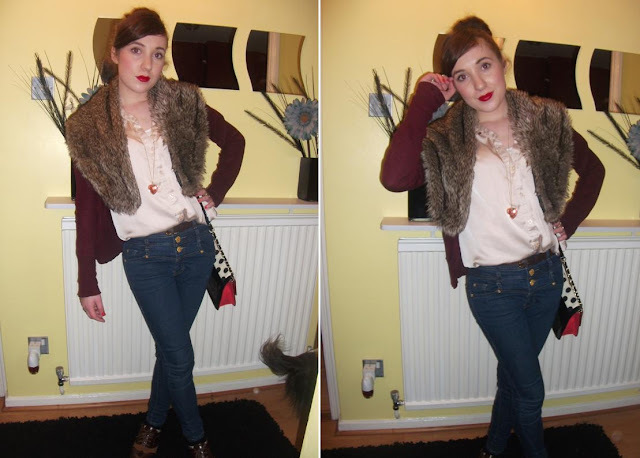 Hello, I thought it was about time I posted another ootd post, just so you know I still exist! Yesterday was the first day in a while that i didn't look completely ill and disgusting so i took the opportunity to go out for dinner with my boyfriend and take a few snaps before hand. Yesterday was such a busy day at uni it was the deadline for an online video magazine that we have been creating in groups, so we had a screening as a class to watch everyones videos with a glass of 'champaigne' after. (O the hard life of a student!) I'm very proud of my group as we managed to get the highest score in the class! good old #332mc. For the video screening everyone had planned to get all dolled up and look pretty... however as you can see i put little effort in. The boys in our class did however look very smart in their shirts! Anyway enough of me rambling on, hope your all enjoying the snow (yet again! ).